Being from Ohio, we’ve come to expect a little blustery, chilly, snowy weather in December. Well, here it is, December 10, and it’s 75 degrees and sunny here in western North Carolina. We saw snow on some of the Craggy Mountains above the town of Black Mountain over Thanksgiving and we were sure that more of the white stuff was on its way to us. But we’ve been pleasantly surprised by the pleasantly warm weather. We have the windows open today, which seems bizarre for us northerners. Supposedly it will be in the upper 60s and lower 70s this week and then the 50s next week…we’ll take it! 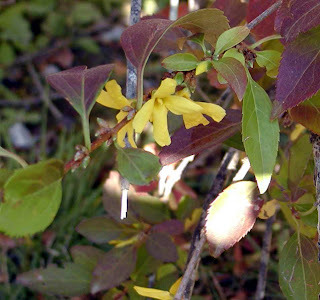 The leaves are gone now, but the forsythia bushes just keep on blooming. We did a little research and it turns out that when a forsythia bush blooms in fall, those are actually the blossoms that should have been reserved for the following spring. So, we’re curious to see just how much these bushes bloom next year. I just spent a couple of days in Asheville doing some work at an area inn. The weather was so gorgeous I felt distinctly overdressed in a turtleneck, but that’s all I packed. It was so mild that I had dinner on the terrace at Grove Park Inn, and they didn’t even have the heaters on two weeks before Christmas! Wow! Great blog. Thanks for sharing.